FFA, known until 1988 as the Future Farmers of America, is a dynamic, intracurricular, student-led organization for young men and women enrolled in agricultural education courses in middle and high schools. Through participation in FFA, members practice skills in animal and plant sciences, mechanics, business, environmental conservation, and leadership. The Louisiana FFA Association is made up of 10,804 members in 199 chapters in 51 parishes. The association is led by an elected group of student officers and adult advisors. Growing Leaders - We prepare the future workforce for Louisiana agriculture and many other industries through real-world opportunities that challenge our members to lead by example. Building Communities - FFA members are civic-minded and active in their communities and exert a positive influence to improve the lives of their fellow citizens. Strengthening Agriculture - Agricultural education was the original STEM, integrating the latest in emerging technology into our curriculum to provide cutting-edge training to our students. The “Future Farmers of America” was founded by a group of young farmers back in 1928. Their mission was to prepare future generations for the challenges of feeding a growing population. The Louisiana FFA Association was chartered two years later in 1930. They taught us that agriculture is more than planting and harvesting–it’s a science, it’s a business, and it’s an art. FFA continues to help the next generation rise up to meet those challenges by helping its members develop their own unique talents and explore their interests in a broad range of career pathways. So today, we are still the Future Farmers of America. But, we are the future biologists, future chemists, future veterinarians, future engineers, and future entrepreneurs of America, too. FFA is structured on three levels: local, state and national. Local chapters are the heart of the organization consisting of students in middle or high schools enrolled in agriscience courses. Each chapter is led by a group of student officers and one or more agriscience teachers serving as the chapter advisors. Chapters develop a local program of activities, participate in FFA career and leadership development events, and apply for FFA degrees and other awards. 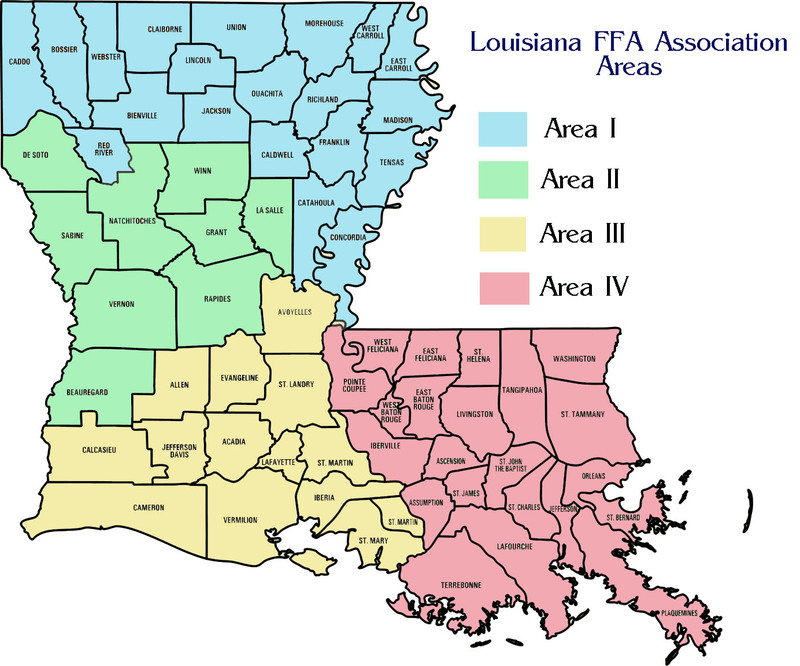 Louisiana FFA is broken into four areas. Each area annually elects student officers and an agriscienceteacher to serve as the area advisor. The area hosts events including career and leadership development events, leadership camp, and chapter officer leadership trainings. On the state level, each local chapter is given the opportunity to vote on important issues at state convention. The association is led by an executive committee composed of eight agricultural educators and 10 student officers. The state association hosts state leadership conferences and career and leadership development events. The state officers represent FFA at university, industry, and partner events. The association establishes procedures for determining state winners in FFA award areas. The National FFA Organization is led by the board of directors composed of agriscience educators, university professors, state FFA staff, and six national student officers. The national organization sets direction for FFA, offers leadership and professional development, and conducts recognition programs. FFA is an integral part of the agricultural education program. To join the FFA you must be enrolled in an agricutlural education course in your local school. Contact your school’s counselor or agriscience instructor to enroll in an agricultural education class and join the FFA. FFA is not a “club.” It is one of three integral components of an agricultural education program: classroom instruction, supervised agricultural experience and FFA. Students between the ages of 12 and 21 who are enrolled in a systematic course of instruction in agricultural education are eligible for membership. Your local school system must offer agriscience instruction and have an active FFA chapter for you to join. If your school doesn’t have an agricultural education program, take steps to open a program in your school. In order to accomplish this task, we strongly recommended that you contact your state agricultural education staff to express your interest, and ask for assistance on regulations, requirements, and resources for planning the new program. The Louisiana FFA Association is governed by a board consisting of agriscience teachers and student state officers.